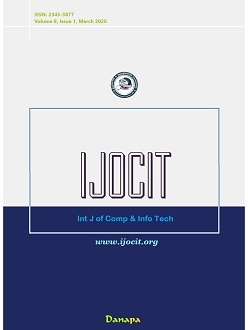 International journal of Computer and Information Technology (IJOCIT) is an open access, online, peer reviewed international with a primary objective to provide research and applications related to all areas of information technology. Computational Models, Formal Methods, Complexity theory, Algorithmic Solutions, Game theory, Information theory, Quantum Information theory, Coding Theory. Communication Theory. Operating Systems, Compiler Design, Programming Languages, Software Architecture, Automated Software Engineering, Graphics, Animation and Game Products, Modeling and Simulation Problems, Multi-Agent Systems (MAS), Real-Time Systems, Linear and Nonlinear Control Systems. Communication Challenges, Wireless Networks, Computer Architecture, Embedded System, VLSI Design, and Hybrid Systems. Array and Optimal Processing, De-Centralized and Distributed System, Parallel Processing, Virtualization Computing, High Performance Computing. Ontology Extraction, Internet Services, User Interfaces and User Experience Design, Web Mining, Web-Based Learning, Information Retrieval. System Biology, Healthcare & Monitoring Systems, Bioinformatics Analysis. Pattern Recognition, Computer Vision, Machine Learning, Evolutionary Computing, Text, Image, Voice and Video Signal Processing, Control and Robotics, Decision Support Systems (DSS), Expert Systems (ES). IT Management, Enterprise Resource Planning (ERP), Supply Chain Management (SCM), E-Learning, E-Shopping, Users Behavior Mining, Data Fusion, Data Mining, Knowledge Management (KM), Risk Management (RM), Social Media Analytics, E-commerce, E-governance, IT Regulation, IT Economic and Business. Cryptography, Cryptanalysis, Cryptocurrency, Security and Privacy, Data Compression and Encryption, Identification, Authentication, Authorization, Auditing, Event and Log Management. It is journal policy to publish work deemed by peer reviewers to be a coherent and sound addition to scientific knowledge and to put less emphasis on interest levels, provided that the research constitutes a useful contribution to the field. IJOCIT invites the all researchers, scientists, scholars, academician, industrialists, lab technologists, PG students, consultancies, and etc., for publishing articles in this journal.